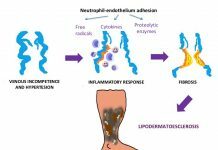 Fibrinous tissue in venous ulcers: what are we talking about? 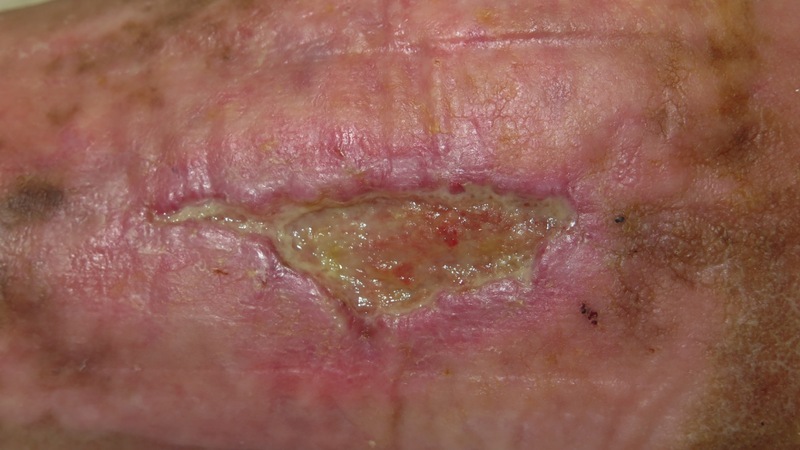 Home Venous ulcers Fibrinous tissue in venous ulcers: what are we talking about? 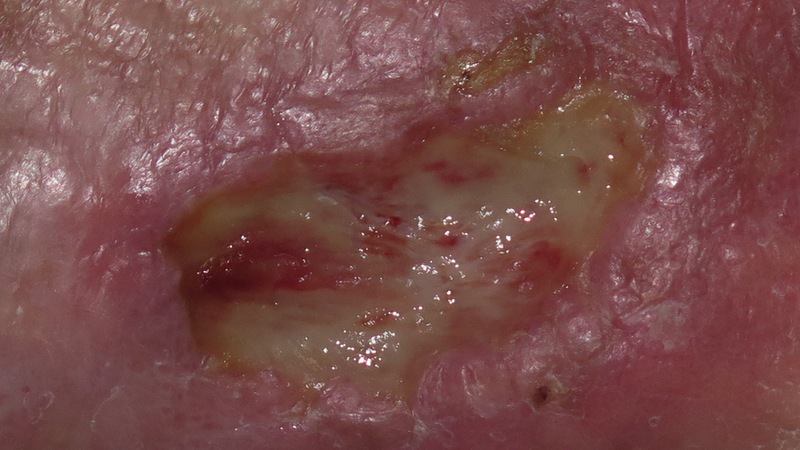 You have probably used and heard many times the sentence “fibrinous tissue in the wound bed”. You may also have been curious to know the composition of this material, the reason for its different colors, how it can differ from the biofilm or what is the best way to remove it. Let’s see if this post solves any of your doubts! Do we call it “fibrinous” because it is formed only of fibrin? What may this material look like? Depending on the amount of moisture in the wound, the colour of this material can vary from whitish to yellow or brown. It often turns grey when silver dressings are used. It may be firmly attached to the wound bed or easily removed. Its consistency may be fibrinous, viscous, gelatinous. How can we differentiate it from biofilm? Biofilms are communities of bacteria organized in a complex way. They synthesize a nutritive and protective matrix (polysaccharides, proteins and cellular detritus) in which they are embedded and which allows them to live adhered to the wound bed. Some authors point out that gel-like consistency and gloss are characteristics of biofilm, while slough normally form an opaque layer over the wound. 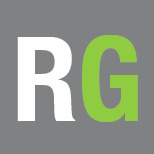 Blue, green or black colour is also typical of overproduction of certain bacteria. In the scientific literature different studies can be found in which algorithms are proposed to help in the clinical suspicion of the presence of biofilm. However, in many cases this differentiation cannot be established, as there is an active interaction between slough and biofilm. 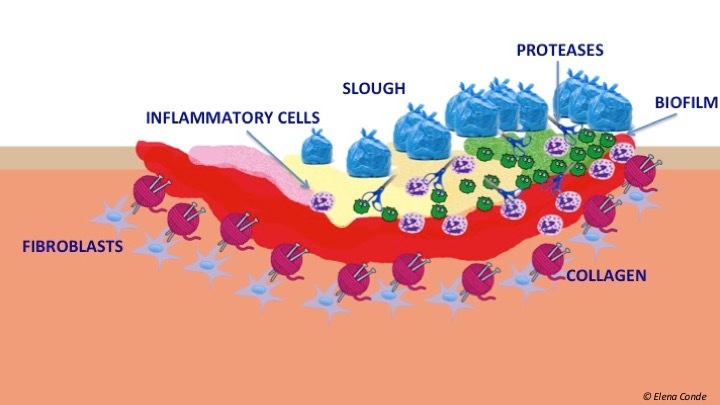 Biofilm stimulates the pro-inflammatory environment of the wound, which increases vascular permeability, exudate production and slough formation. Therefore, rather than two separate entities, we should consider a vicious cycle that develops in most chronic wounds (Up to 90% of chronic wounds have biofilm). Clinical identification of biofilm is important because conventional culture methods are not useful for detecting these organized bacteria in complex structures. Advanced microscopy methods or specialized culture techniques, which are normally only used in research studies, are needed. How to remove slough from the wound bed? Most uncomplicated venous ulcers have relatively little devitalized tissue on the surface and do not need debridement. However, in long-standing recalcitrant ulcers, it is common to find a fibrinous tissue, opaque or shiny, tightly adhered to the wound bed. Cleansing and sharp debridement under topical anaesthesia are fundamental pillars in the removal of slough from a venous ulcer. However, in this type of wound it is essential to control both oedema and exudate with the choice of the appropriate dressing but, above all, with an adequate COMPRESSION THERAPY. This will have a direct impact on the improvement of the perilesional skin, the reduction of nutrients for the biofilm and pro-inflammatory cells and molecules. Retromaleolar ulcers have a high tendency to produce slough and, therefore, greater chronicity. Sharp debridement and methods to increase local pressure in that concave area of the leg, such as placement of a foam pad, may be helpful in these cases. 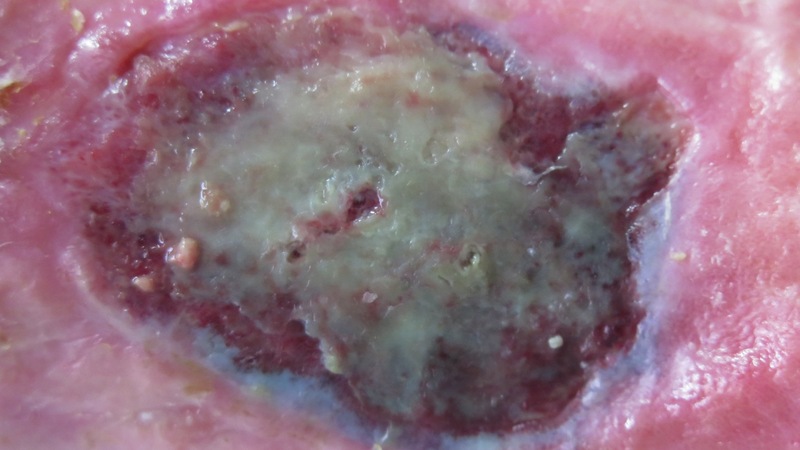 Biofilm is a material that is rapidly reorganized and can reappear in the wound within 24 hours. Therefore, cleansing and debridement, the use of dressings that protect the wound from new germs and decrease metalloproteinase activity, and the use of products with antimicrobial activity are important. In a nutshell, it seems an easy task. However, biofilm control is a real therapeutic challenge. It is necessary to better understand the behaviour of these bacterial armies in order to develop specific weapons to attack them. 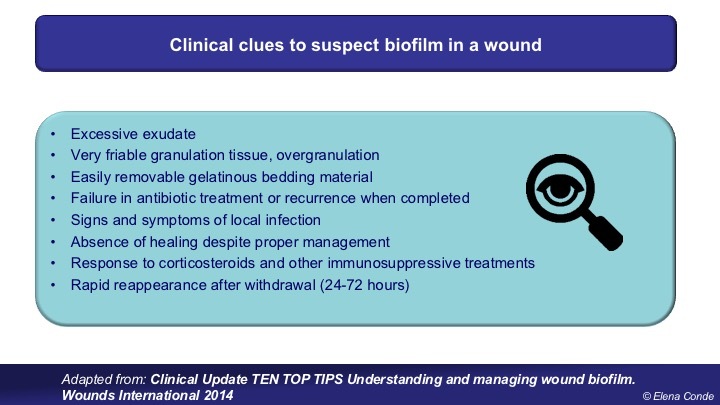 We have to bear in mind that biofilm is one of the main factors involved in promoting chronicity of wounds. Metcalf DG, Bowler PG, Hurlow J. 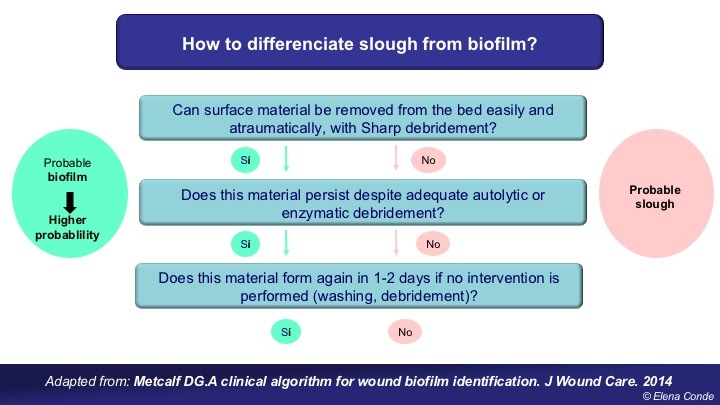 A clinical algorithm for wound biofilm identification. J Wound Care. 2014 Mar;23(3):137-8, 140-2. European Wound Management Association (EWMA). Position Document: Wound Bed Preparation in Practice. London: MEP Ltd, 2004. 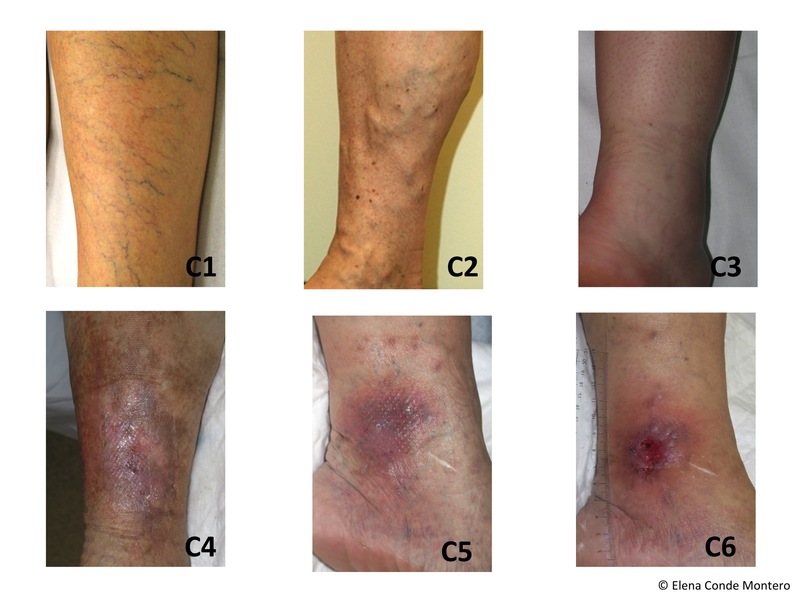 CEAP Classification of Chronic Venous Disorders: Let’s all speak the same language.